Batman Park is located towards the northern end of the Yarra River in Melbourne. It was established in 1982 and was named after John Batman; one of the chief contributors and founders of Melbourne. Visitors are welcome to explore this serene parkland and enjoy nature � perfect for a weekend get-together. Visitors will be happy to know that Batman Park has outdoor picnic areas and BBQ facilities. Enterprize Park and the Melbourne Aquarium have since been added as neighbours. It also a part of Yarra River Promenade which provides amazing views of the Melbourne skyline and the Southbank. This image belongs to the travel and nature stock photo library. This stock photo of Panorama of the Southbank at Sunset is available for licensing for commercial and editorial uses including websites, blogs, books, magazines, brochures and advertising. Restrictions may apply for images which contain third party copyrighted material or sensitive subjects. Photos of artwork are for editorial use only. 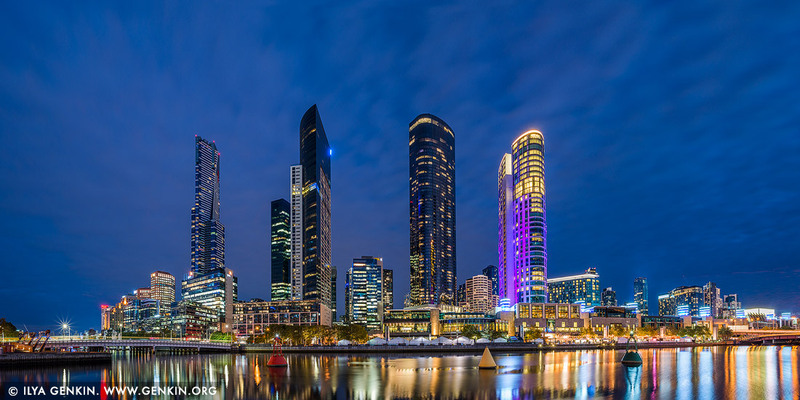 This image id AU-MELBOURNE-0016 of Panorama of the Southbank at Sunset, is copyrighted © by Ilya Genkin. This is not a public domain image.